Home » The Rapid RH® Concrete Moisture Test » Concrete Information & Knowledge Base » Why Measure pH and RH levels in Concrete before Installing Floors? Flooring contractors who work with concrete floor slabs may need to take both pH (potential hydrogen) and RH (relative humidity) levels of concrete into serious consideration before attempting to install any flooring materials or risk costly project failures. When water dissolves additives in liquid, the liquid will have either an acid or alkaline (base/basicity) content. Concrete manufacturers mix aggregate and cement with water to ensure its strength and stability, however the pH of the water in the mix changes during the process. When applying adhesives to bond a floor covering to concrete, flooring installers must adhere to manufacturer pH guidelines. 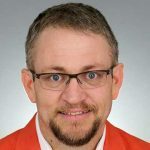 If they don’t, the adhesives, finishes, and flooring materials they use will likely debond, blister, stain, or suffer other major performance problems. In addition, concrete additives, along with the natural hydration process of the concrete, introduce some level of either acid or base to the existing moisture of a concrete slab. Acids form hydrogen (positive ions) when added to water and bases form hydroxide (negative ions). Neither one is inherently good or bad, but they both have different atomic reactions when added to water. In general, pH readings measure acidity versus basicity. The pH scale ranges from 0 to 14. For example, the pH of battery acid is zero, while liquid drain cleaner has a pH of 14. In relation to concrete and floor installations, many adhesive manufacturers require pH levels of 10 or below. Unfortunately, freshly-poured concrete has a pH of 12 to 13. This pH is due to the formation of calcium hydroxide during the hydration process. The calcium hydroxide, in turn, reacts with carbon dioxide in the air, forming calcium carbonate, which reduces pH at the surface. Once poured, the top surface of concrete slabs will exhibit a moisture layer which belies the actual amount of moisture in the slab. That’s why it’s necessary to test inside the concrete first before laying the floor covering so the appropriately selected adhesives will bond as they should. 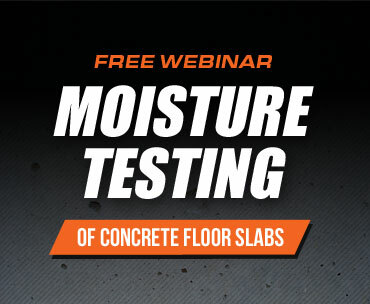 This “inside” test, known as the in situ RH test, is a scientifically proven method indicating the true moisture condition of the concrete slab. Studies have clearly demonstrated the test’s reliability and accuracy. Moving ahead with a flooring installation while lacking reliable information about the slab’s moisture condition would be risky. If the concrete slab is not allowed sufficient time to dry before flooring is installed, the litigation and repair costs due to a moisture-related flooring failure could spiral out of control. Keep in mind that concrete and adhesive manufacturers produce guidelines which installers must consider before proceeding with a certain product. Changes in local weather, humidity, and seasons can also influence the outcome. Thankfully, simple assessment tools exist for both RH and pH. 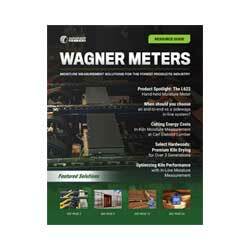 Wagner Meters has developed accurate and cost-effective digital technology, known as the Rapid RH®, for fast, cost-effective RH readings. Our calibrated RH probes can be installed by contractors to 40% slab depth (of a slab drying from one side) and easily read data from a digital, wireless reader (by using the DataMasterTM app, which is compatible with most mobile devices). The Rapid RH® is specifically designed to make it easy to take multiple measurements of each test location and accurately determine when a concrete slab has reached an appropriate RH moisture condition for flooring to be applied. The Rapid RH® Starter Kit is a good way to get testing. 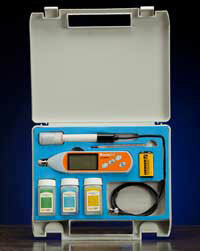 The digital pH meter is a valuable accessory to the Rapid RH® moisture measurement system. 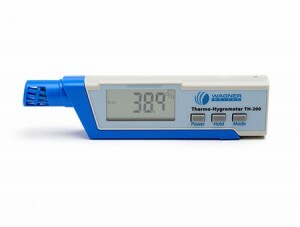 The pH meter is designed for precision and convenience, and Wagner Meters recommends utilizing its pH test kit as an integral part of Rapid RH® moisture content assessment. Slab moisture condition and pH are interrelated but measured separately. Generally speaking, the pH will be higher when the RH in the concrete is higher. High pH, as we’ve seen, just like high moisture levels, can make the concrete slab ill-suited for a proper flooring installation. For this reason, it’s strongly advised that flooring installers and contractors obtain a conclusive assessment of both factors in order to give the “okay” to go ahead with a job. Of course, this goes without saying where both measurements are required. Research has proven the in situ RH assessment method to be the most accurate method for determining the RH of a concrete slab. And achieving the appropriate RH level will also help ensure the appropriate pH level for a safe, long-lasting flooring installation. I bought some kahrs engineered wood flooring. Arrived January 2018. Grande collection manor Oak. 3/4 inch T & G.
when the shipment arrived, I noticed that manufacturing date may be Nov. 2010. Is that acceptable? do these boxes (even though packed) have a shelf life? How would I make sure that boards are safe to use. Thank You. Thanks for the comment. Depending on the storage conditions and/or the amount of time the product is allowed to acclimate to the environment it is being installed in, things are probably ok. That being said, I would recommend contacting the manufacturer to get their input. This is a helpful article. I had a company put vinyl flooring over my concrete and it is coming up in less than a month. They came and said I must have got it wet. They re-glued the places that were coming up but it is doing the same thing. I do not believe they did this testing before applying the flooring and pressure sensitive glue. Now that it is still coming up after re gluing they are assuming I have a leak under my floor. Of course I don’t know for sure, but I think it is happening from an error on their part based on your article and some others I have read. Thanks for the question. It’s hard to say what the “issue” is without having some diagnostic information. In this situation, I can’t even begin to evaluate whether moisture is the culprit without testing results and with this, any flooring/adhesive product I am aware of requires some type of moisture testing prior to installation. So talking to the adhesive and flooring manufacturer about their requirements should give you the information you need to then ask the installer for your specific information. Once you have this information, making a determination of cause may be easier. Hi thank you for sharing the invaluable insights. I have a number of issue which could be related to the concrete slab foundation. (1) White deposits appearing on surface of brickwork on the lower course of bricks on one side if the house. The white deposits could be scratched off quite easily. Also, the mortar is coming loose leaving gaps in between. (2) Also the soil next to the course of brickwork is constantly damp even up close to the surface, though further out from the brickwork it’s already dried out. It is unusual as we have extremely dry weather since the occasional downpour of about a month ago where a fair amount if water may have got around the perimeters of the foundation slab. Internally, the porcelain tiles that were laid about a year ago appears to be intact. (There’s no water leaks from pipes, neither any broken storm water. Not sure how to check the internal grey water pipes for leaks). (3) In one of the rooms, there is a recurring smell resembling damp plaster however the paintwork did not appear to have been compromised. I had placed a 300gm Sunfresh moisture absorber to extract moisture simultaneously at two spots. There is around 15mls collected in each container the last month which I am not sure if it is considered excessive or abnormal. Grateful to hear your suggestions and insights. Kind regards. Thanks for the comments. It sounds like much of this may be just normal moisture migration, whether due to condensation or latent moisture in the materials. Of the issues you mentioned, the loose mortar would be one I would definitely investigate. I would look to find a reputable building inspector to help evaluate this situation. Good luck. Thank you Jason for taking time to share your thoughts. Much appreciated.